Kaduna State and global corporate giant General Electric today flagged-off a programme to equip 278 health care facilities in Kaduna State. This is the biggest ever refit of the public healthcare infrastructure in the state. It represents the Kaduna State Government’s effort to provide a comprehensive solution to the healthcare challenges in the state, including maternal and infant mortality, communicable illnesses and the problems caused by the growth of chronic conditions like diabetes, heart disease and cancer. 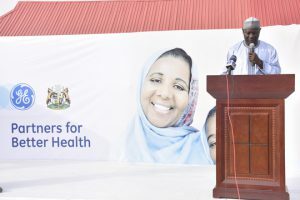 At its first health summit held last year, Malam Nasir El-Rufai, governor of the state, announced the determination of the government to the perils that pregnant mothers and infants face. He said it is a priority to improve health outcomes for ordinary people. To achieve these goals, Kaduna State is striving to improve primary healthcare for all people, while at the same time, improving the quality and readiness of health service delivery by ramping up the supply and quality of health professionals. Under the partnership between GE and Kaduna State, 255 primary health centres will be equipped along with 23 general hospitals across the state. The programme also includes a package of training for the healthcare professionals and a three-year maintenance agreement for the equipment. The project will deliver at least one refitted hospital in each of the 255 wards in the state. Farid Fezoua, CEO of GE Healthcare Africa, said that “GE applauds the Kaduna State Government for its vision to improve health care for the citizens”. Kaduna State is putting units of relevant medical technology including ultrasound, heart monitors, neonatal incubators and anaesthesia machines – into the hands of our health workers. Ultrasounds are used to detect a range of conditions. It improves the accuracy of tests conducted on the foetus when pregnant women undertake ante-natal visits and can aid early detection of and referral of pregnancy complications. V-Scan Access assists primary healthcare workers – such as midwives, general practitioners, paramedics and clinical officers – in low-resource settings to provide information to the user during pregnancy assessments. The heart monitoring devices will address cardiovascular screening issues and improve the management of high blood pressure, cholesterol or high blood glucose. GE’s basic cardiac screening device connect hearts to digital ECG, helping clinicians test more patients in less time. The multi-year partnership between Kaduna State and GE will increase access to essential technologies for better maternal and infant care, heart screenings to tackle the rise of cardiovascular illnesses and improved care during surgeries. This combination of new technology, maintenance and training will improve healthcare outcomes in Kaduna State. Copyright © 2019 Ministry of Women Affairs and Social Development. Designed and Managed by Hallowgate. Theme: KDSG by Hallowgate.